The Innovator's Dilemma , a business book from a few years back, introduced the concept of a "disruptive technology". The author, Clayton Christensen, described how large, successful companies come to be toppled by small competitors. As a large company is incrementally improving its product in order to better satisfy its existing customers, a smaller company may exploit a new technology to manufacture something similar. The small company's product is inferior, but it's also cheaper and so creates a new market, unserved by the established product. Over time the new technology improves and its market grows, until it finally wins over the large company's customers. The Dublin whiskey industry of the nineteenth century would recognise this pattern. For them, the disruptive technology was the Coffey, or column, still. Patented by Aeneas Coffey in 1831, this still could produce almost pure alcohol faster and more cheaply than the huge copper pots used up to that point. This alcohol hardly resembled whiskey, but it could be "blended" with traditionally made whiskey to create a cheaper, lighter tasting drink that immediately found favour with the public. The great Irish distilling houses railed against this innovation, refusing to accept that the resulting concoction was worthy of being called whiskey. They spent decades trying to get the law bent to their way of thinking. In this, as we know, they failed: most Irish whiskey sold today is just such a blend. Unfortunately the industry waited too long to embrace the inevitable; its principled stand contributed to the long decline of the Irish whiskey business that has only recently been reversed. In 1878, however, the fight was still on. The four great Dublin whiskey houses - John Jameson, William Jameson, George Roe and John Power - had joined forces to campaign for a strict legal definition of whiskey. They got nowhere in the London parliament so they decided to appeal to the public directly. The result was a book, Truths About Whisky (yes, "whisky", without an 'e'!). Today, a combative CEO might start a blog to put his side of the argument. Truths About Whisky is a blog in book form. It's opinionated, one-sided and angry. It spins tales of fraudsters, and dishes the dirt on publicans and devious middlemen. It denounces government ministers as mere puppets of their civil servants, who themselves are tainted by corruption. It is impassioned and personal. The campaign against the Coffey still is usually presented as evidence of the shortsightedness of the Dublin distillers. But it's clear from this book that they had genuine grievances. Without legal protection, for example, a cheap Scotch could be passed off as a more desirable Irish spirit by shipping it to a bonded warehouse in Dublin and shipping it out again, having acquired a Dublin customs permit. And, while distillers are today required to use grain as the feedstock for their Coffey stills, back then any cheap sugary or starchy material might do. Since the still output was close to pure alcohol and thus did not retain the taste of its ingredients, spirit could be made from, say, molasses or rotten potatoes. It was a mere basis, a foundation, plastic to the hand of the compounder, and capable of being converted into sham Whisky, or sham brandy, or sham rum, as well as into honest doctors' stuff or into good varnish. He had given a glass and a half of the spirit to a boy named Bradley. After drinking it, Bradley leaped clean up off the ground, then threw himself down on his mouth and nose, and endeavoured to knock his brains out. When lying on the ground, he wanted to eat the flesh off his arms. Contamination in this case, which went to court, was proven by scientific analysis. Bradley survived, by the way. Pure alcohol and water, or nearly so, without distinctive flavour or quality, and without capacity for improvement. With the benefit of hindsight, it is easy to see how the Dublin distillers were their own worst enemies. Not only did they dismiss the Coffey still out of hand, they also effectively abandoned all quality control over their product at the factory gate. The book makes clear that they sold their whiskey by the cask at a young age, refusing to bottle or fully mature it themselves. They therefore had no means to ensure that the end customer's glass contained the genuine, unadulterated and unblended product. Too late, they realised that many consumers of Irish whiskey in England had not, in fact, been drinking the real thing at all. In desperation, two distillers, George Roe and William Jameson, decided to produce a reference bottling of their own output. This would be four to six years old, securely sealed and supplied to retailers of wine and spirits. They hoped that the drinking public would sample these bottles and take the publicans and spirit merchants to task for selling substandard imitations. The grievances listed in Truths About Whisky were not finally settled, one way or the other, until the Royal Commission on Whisky report in 1909. But the book is an important historical record of an industry undergoing painful change. It has, until very recently, been almost impossible (or at least very costly) to find a copy. Fortunately, there is a publishing company in Scotland dedicated to resurrecting such lost gems. 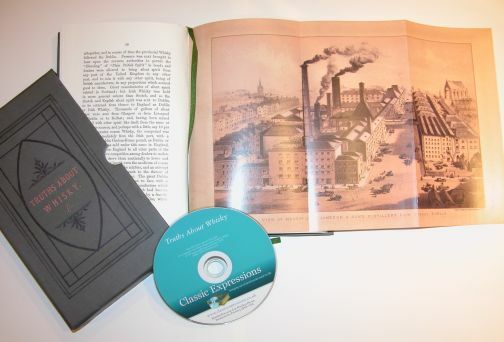 Classic Expressions has produced a very handsome facsimile of Truths About Whisky that includes four fold-out plate illustrations of the Dublin distilleries. It also comes with a CD that holds a PDF copy of the book. This PDF is searchable, a real timesaver when looking for a specific detail. For anyone interested in the history and development of Irish whiskey, Truths About Whisky is a valuable source. We are indebted to Ian Buxton and Classic Expressions for once again making it available.